Fairest of Them All is a 5 reel and 20 payline slot game produced by Playtech. The game is based on the story of Snow White and the Seven Dwarfs with the title being a famous line from Snow White's evil stepmother. The graphics are of a very high quality and the symbols and visuals are rich in detail and color. The background of the game is a whimsical, enchanted forest filled with trees, flowers and filtered sunlight. Players can expect to see their favorite characters from the story including the Prince, Snow White, the evil Step-Mother and the Dwarfs. Gives a maximum of 5 Scatter symbols to the reels and guarantees a bonus round. Awards players with 2 or 3 reel re-spins into a guaranteed win. Will turn winning symbols into more valuable symbols to increase your winnings. Adds a maximum of 5 extra Wilds to the reels. Rewards players with up to 3 stacked Wilds. Awards players with multiplying their winnings by 30x. The Mine Bonus Game is triggered by landing 3 or more Dwarf Bonus symbols on reels 1, 3 and 5. You will be taken to an underground mine where you must choose your favorite dwarf to help you mine. Players will then need to select where they want their dwarf to start digging. Players can uncover cash prizes that will be added together at the end of the round. Dwarfs also have cash values attaches that will be added to the total too. The Wild Symbol in this game is the icon of the game's logo. It can replace all other symbols in the game except for the Scatter and the Bonus symbols. 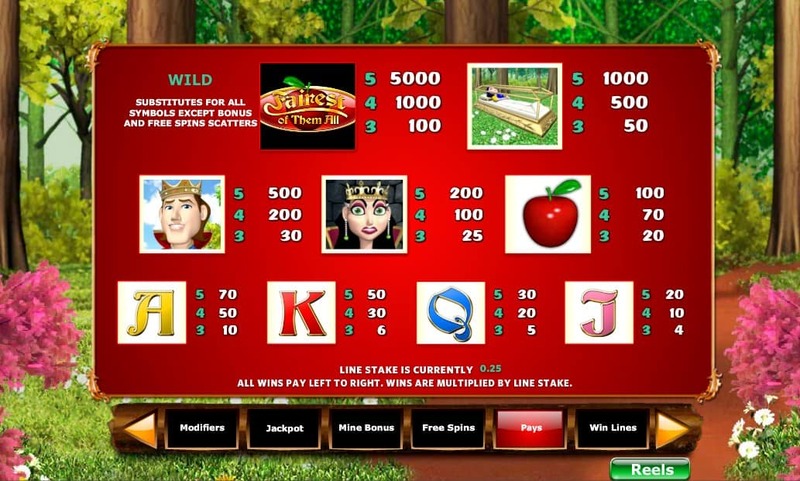 The Wild also acts as an individual symbol and can award players with up to 5000x their bet. The Free Spins Round will be activated by landing 3 Free Spins Mirror symbols on reels 2, 3 and 5. Players will automatically be awarded with 10 Free Spins and will have the opportunity to win further free spins and multipliers within the round. 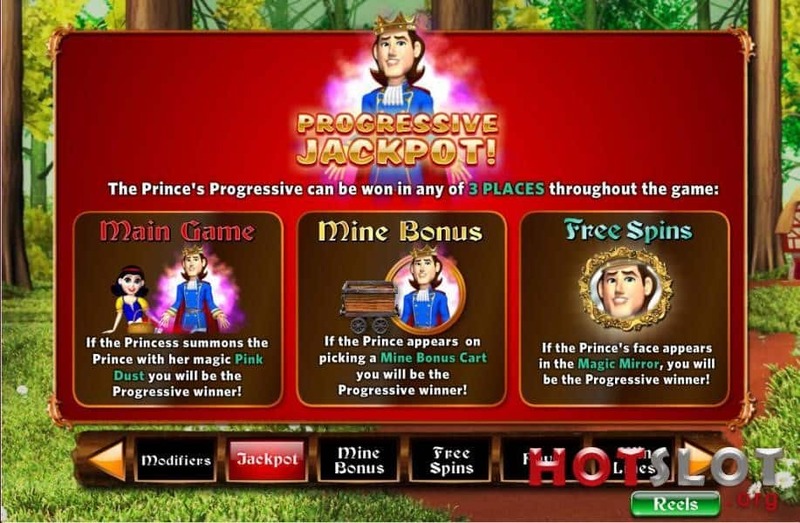 If the Prince appears in the mirror in the Free Spins. The Wild is the symbol is the game's logo and can substitute for all of the game symbols except for the Scatter and the Bonus symbols. Fairest of Them All is possibly one of Playtech's most feature-rich games. There is a plethora of bonus features that create interesting game-play and enjoyable reel-spinning. A certain anticipation is created as players wait for their next reward. The graphics are engaging and well designed and have a 3-D quality which makes Fairest of Them All a top notch game.